Heard the buzz about coconut wax and want to try it out? Get started with IGI 6046. To help you get the best results, we're sharing our lab notes with everything you need to know about working with this wax. Aesthetics: We tested for shrinkage, mottling, and color retention. Fragrance Performance: We looked at solubility, retention, and cold and hot throw performance. Burn Performance: We tested various wick series and sizes to find the best burn. For the fragrance testing segments, we used Caribbean Teakwood, Sparkling Grapefruit, and Very Vanilla fragrance oils. They have very different densities, viscosities, and ingredients. We hoped the variation would reveal potential solubility and burn issues. This wax is a proprietary blend of coconut wax and paraffin wax. 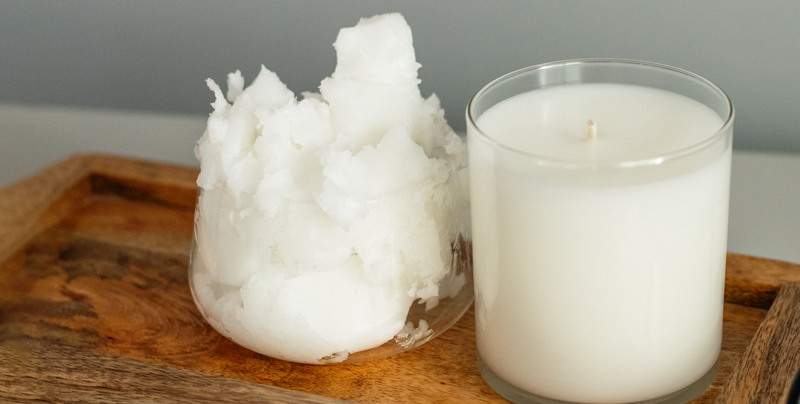 Coconut is one of the newest vegetable waxes on the market and is known for making beautiful, creamy candles with excellent hot throw along with a slow burn, similar to soy wax. This wax comes in a solid 25 lb block, similar to the IGI 4627 paraffin wax, and has a creamy white color. After manufacturing, the liquid wax is filled directly into a thick plastic bag and then cooled before sealing the bag. This can make using the wax slightly more challenging, but we think you’ll forget about that once you see how this wax performs. The wax is soft and not overly sticky, but you’ll find that wearing latex or nitrile gloves makes working with the wax much more pleasant, especially while scooping the wax out the bag. We found the wax easy to cut, almost like a block of soft cheese. We were able to use our stirring spatula to cut off chunks of the wax. We found that pouring at a high temperature, 165º +/- 5º, gave the best glass adhesion and smooth surfaces. We saw that tall, narrow jars tend to shrink more through the center so they may need a second pour to level the top. We also found if the work area was too cool, the wax would form small holes in the surface that went deep into the candle. Warming the jar slightly may help minimize this shrinkage and eliminate the need for a second pour. Until you’ve perfected your process with this wax you should be prepared to do a second pour. Because this blend does contain paraffin wax, we believe this wax will not have issues with frosting. Paraffin wax can crystallize in some situations, which looks similar to the frosting often seen on vegetable waxes. 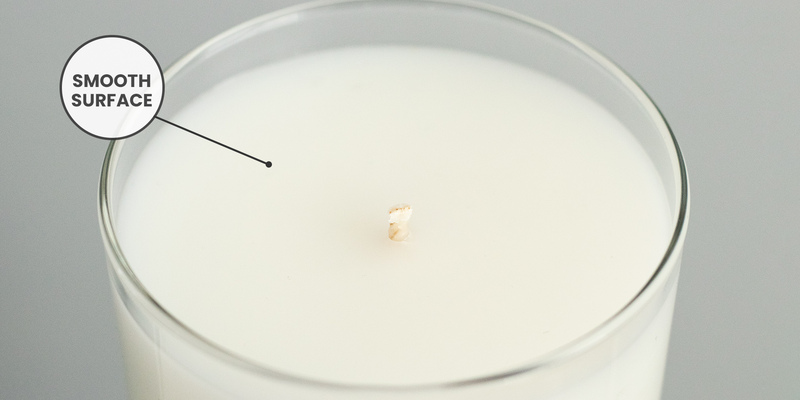 We checked our initial test candles after 6 months and did not see any signs of frosting or crystallization. Warming your jars and pouring at a hotter temperature should eliminate the potential for any crystallization that could occur. This wax is bright white, so we expected it to produce very vivid colors with the minimum usage rates. We tested 2 drops per pound of Red liquid dye and Key West liquid dye and 3 drops per pound of Orange liquid dye. The color mixed in quickly and easily. The Red produced a dark pink shade similar to what straight paraffin would produce. The Key West produced a vivid spring green shade. The Orange was fairly dark but still similar to what paraffin wax alone would produce. Other than discoloration caused by the fragrance oil, we would not expect to see the color shift that is common in many natural waxes. This wax can easily hold up to 10% (1 ⅔ oz) fragrance oil, but most fragrances will not require that much to get a really strong hot throw. We tested various fragrance loads and found that they were all very strong. We did not have any trouble mixing in fragrances at loads between 6 and 10%. To really push the envelope, we added 12% Very Vanilla at 185ºF and did find that it took a little extra stirring to fully incorporate all of the fragrance into the wax. We do not recommend using this much fragrance in the wax but thought it would be interesting to see if it would hold the fragrance or if we’d see some fragrance leeching. After 24 hours the fragrance oil had discolored the wax to a creamy yellow color. Although we did not see visible signs of fragrance oil leeching, we did see places on the surface that were not discolored, indicating that the fragrance had separated from the wax in some areas. 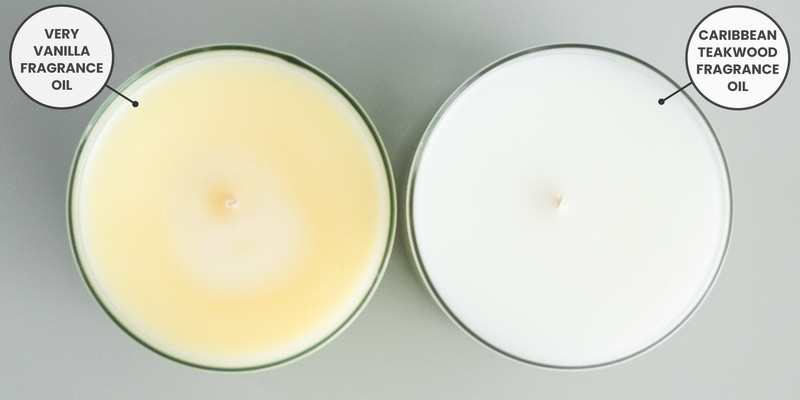 We created test candles using Caribbean Teakwood at 6% and 7.5% fragrance loads. We checked for cold throw performance at 24 hours and at one week. After 24 hours the cold throw was very strong. After one week the cold throw was still very strong. After 48 hours we tested one candle with Caribbean Teakwood at 6% for hot throw. The hot throw was almost a 3 on our scale. At the one-week point, we began our burn tests. We burned the candles for two hours before examining the hot throw. Our candles with 6% fragrance loads rated a solid 3 on our scale. For best results, we recommend fragrance loads of 6% to 8% and cure times of at least three days. 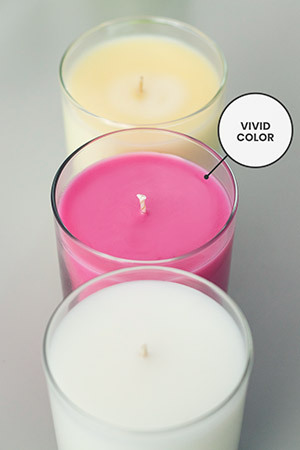 We have not worked with coconut blend waxes so we were not sure what type of wick would work best overall. Most vegetable waxes perform well with paper or cotton fibers woven into them, such as the CD, ECO, or HTP series. We did an initial test with all 5 of our wick series. Overall, this wax seems pretty friendly to any wick series. We found the CD and ECO to be our favorite, but prefer the CD for the variety of sizes the series offers. Many series we found either the largest or next to largest wick in the series was best for a 3” diameter. The downside there is if you need to wick up for a particular fragrance and/or dye combination you don’t have many options. 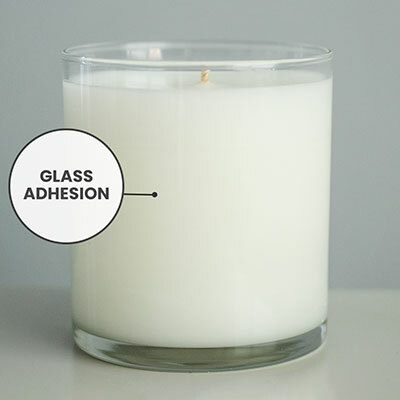 If you want to use a container that is over 3.25” you may have to double wick your container. The CD will mushroom even when properly wicked so make sure you are trimming your wick between burn cycles to get the very best performance. This wax does seem to be easy to burn overall. Smaller containers can easily be overwicked so please use caution and perform wick testing. Visit our wick guide for suggestions on where to start your testing based on your particular container diameter. As always, we strongly recommend that you test this wax with your fragrances and dyes for best results. And remember, we’re always here to help with questions. Call 1-888-266-3916, email support@candlescience.com, or connect with us on Facebook, Twitter, or Instagram.